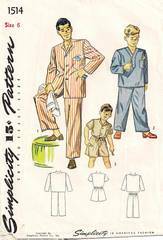 Vintage Simplicity sewing pattern 1514. Trousers have drawstring waist and are finished with a one-button fly front. The coat is trimmed with a patch pocket. Front button closure or pullover style with neckband.